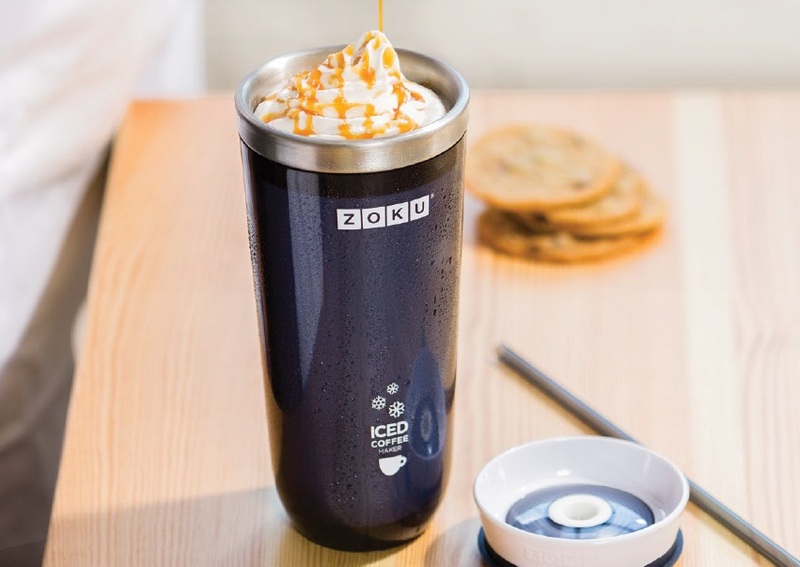 Make Iced Coffee Fast (and Iced Tea too) with the Zoku Iced Coffee Maker. This high-performance iced coffee maker will make refreshing iced coffee or tea in as little as 5 minutes. Just pour in your favorite hot coffee or tea, brewed any way you like, and it will be chilled in minutes — no ice is needed! This design-driven travel mug is spill-resistant, comes with a sipping straw, and is great for drinking on-the-go. Add cream, soy milk, sweetener or spices — the possibilities are endless! The Iced Coffee Maker is designed to store easily in your freezer. To use, remove the frozen stainless steel mug from the freezer and place it into the insulating sleeve, pour in your favorite piping-hot coffee, press on the lid, and enjoy refreshing iced coffee in minutes! The Iced Coffee Maker is available in 4 stylish colors!